it was a great adventure with nina here in wilmington to teach the "wilmington wrap" workshop. 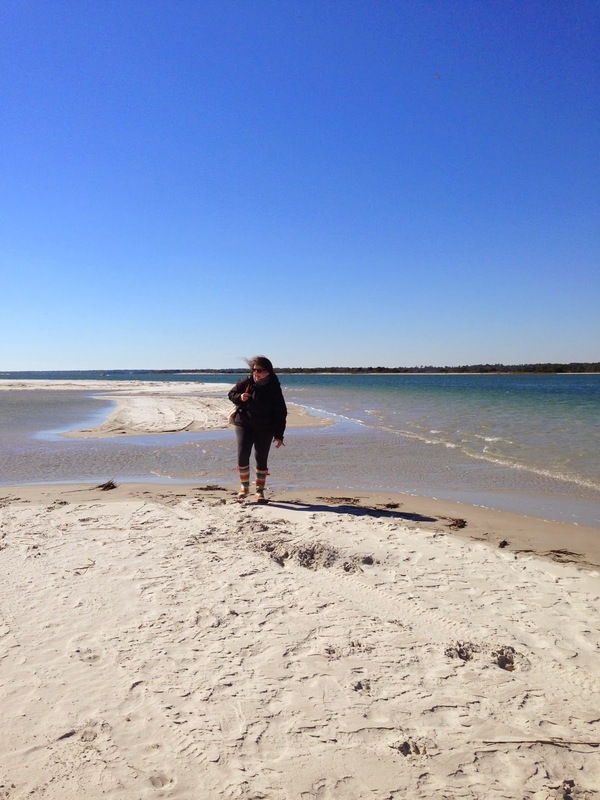 first on the agenda…..get to masonboro island to look for treasures. it was a beautiful day. crisp, cold and windy, but perfect on the island. libby took us over and we had a few hours to enjoy the pristine, uninhabited island…all to ourselves. nina's son, (roy) came over with us and it was sweet to see the mother and son bond between them. 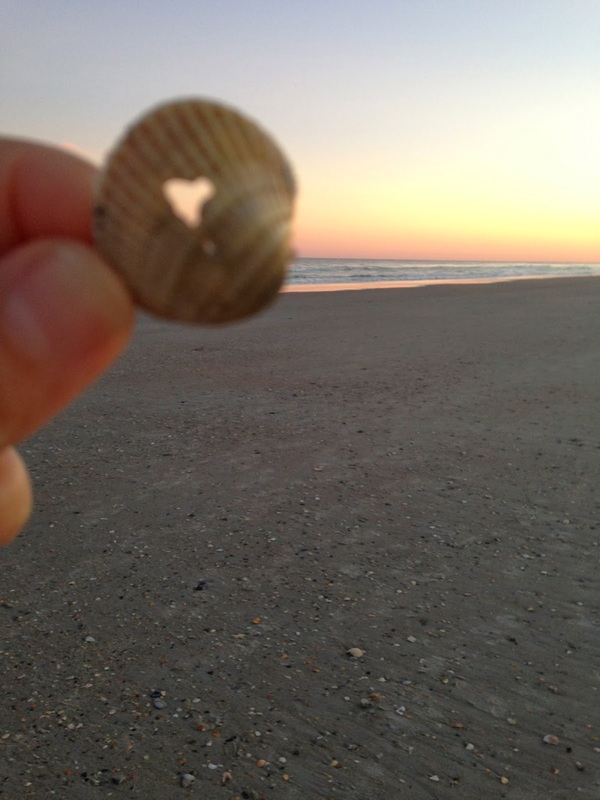 we all left with bits and pieces from the sea and treasured memories. 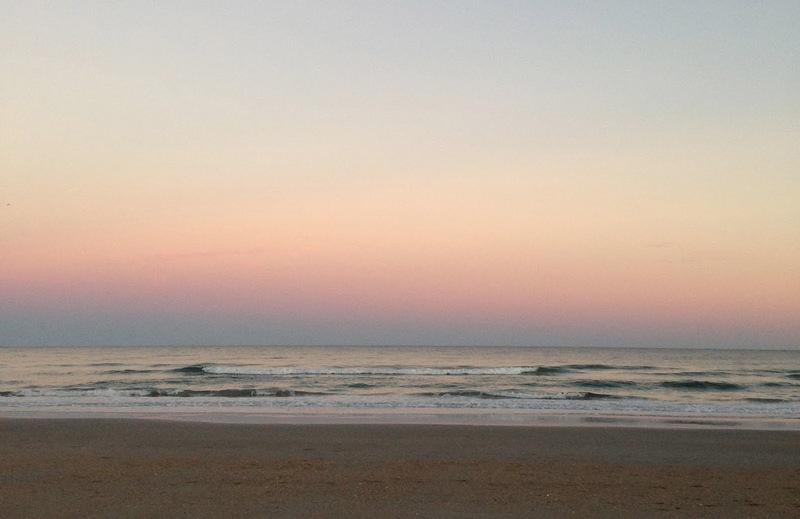 next on the agenda….north end of wrightsville beach for shelling and sunset. 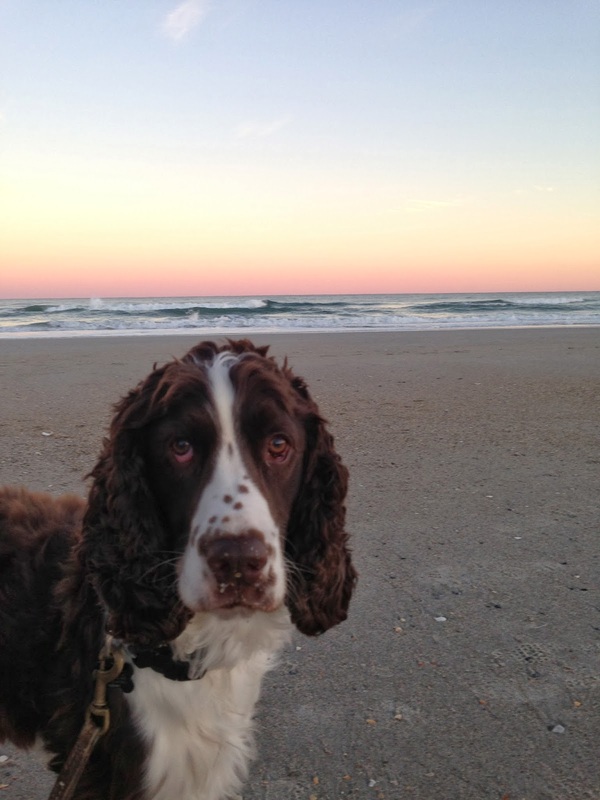 yes, this is walter….nina's sweet "only child" dog. he has a huge personality and entertained us all with his crazy running around and around in circles on the beach. (the rips as nina calls it)…. this was his first beach trip :) we met up with a few of the students and enjoyed the low tide treasures and the beautiful sunset. always, always finding heart shaped treasures and thankful for that little bit of love. 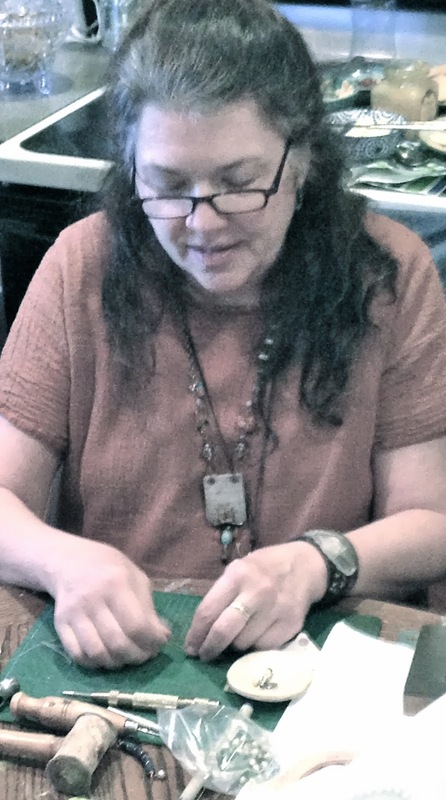 nina teaching in my heART space studio. she is a soulful, spirited teacher. we all learned a lot from her. the stories that go along with her teaching are priceless. 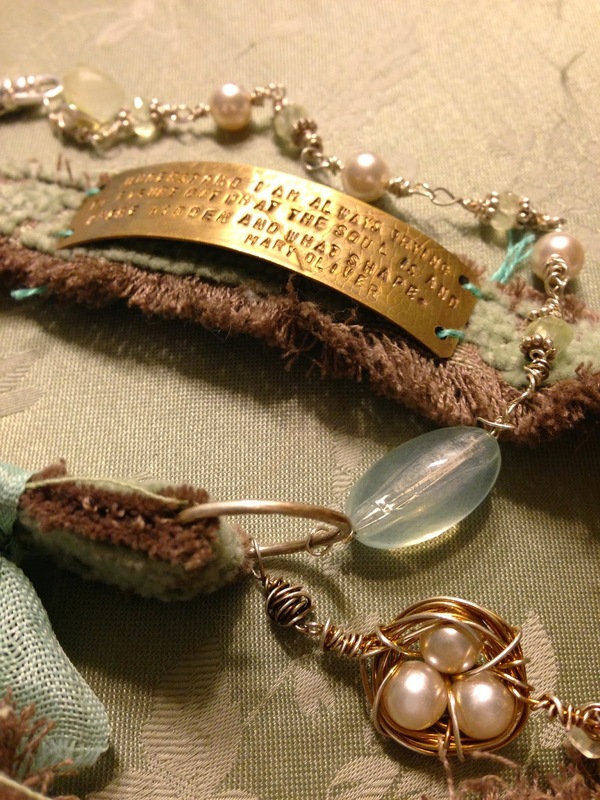 the jewelry she designs is soulful and filled with words and memories. 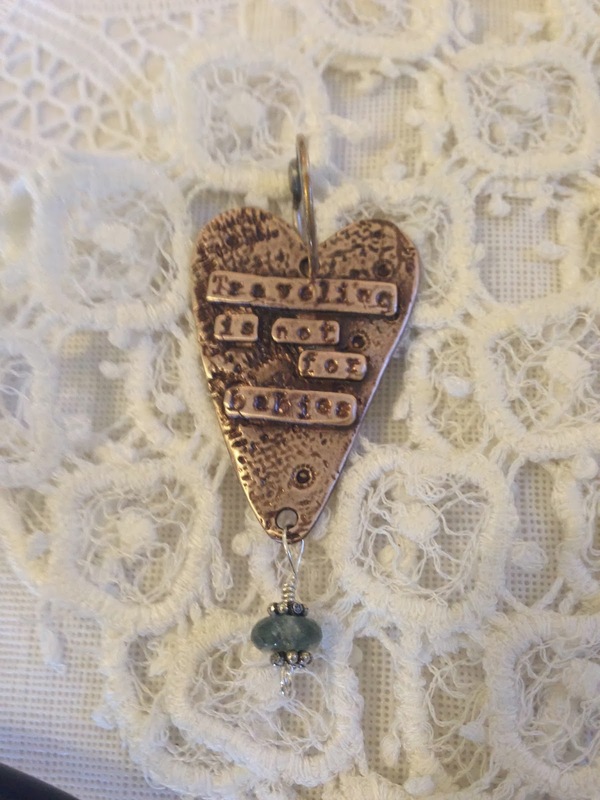 this is a charm that she had made and gifted the students with. "traveling is not for babies" ……her father's words to her as she traveled and taught around the country. he was a proud dad and his words are treasured. i embellished mine with a little stone and jump ring and have added to a chain to wear as is. 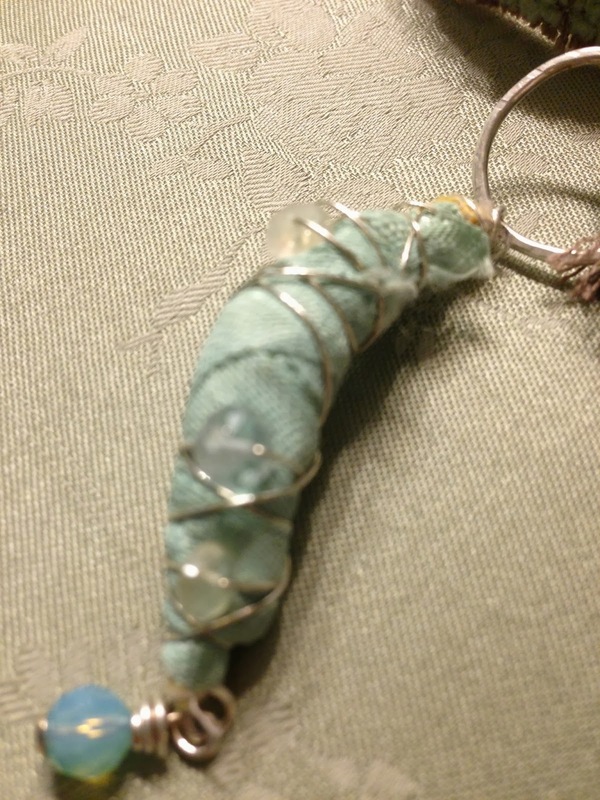 others incorporated it into their wrap bracelets…. added to the wrap bracelet i made in the class. finished my bracelet. i love the moss aquamarine beads that nina gave me. and the little birds nest she taught us how to make. 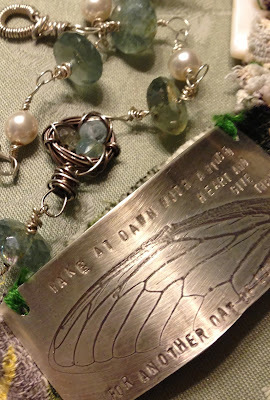 the little cocoon at the bottom of the bracelet was made and gifted to me by nina. i love having her beautiful work incorporated into my wrap bracelet. we had a great time together, but it was too short and it was a whirlwind. 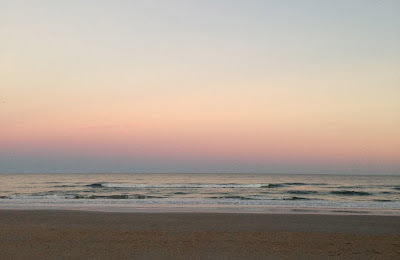 i thank everyone who came to wilmington to enjoy time with nina. and i'm grateful for all adventures, memories and new friends made during our time together. it was nice to have my art with me. 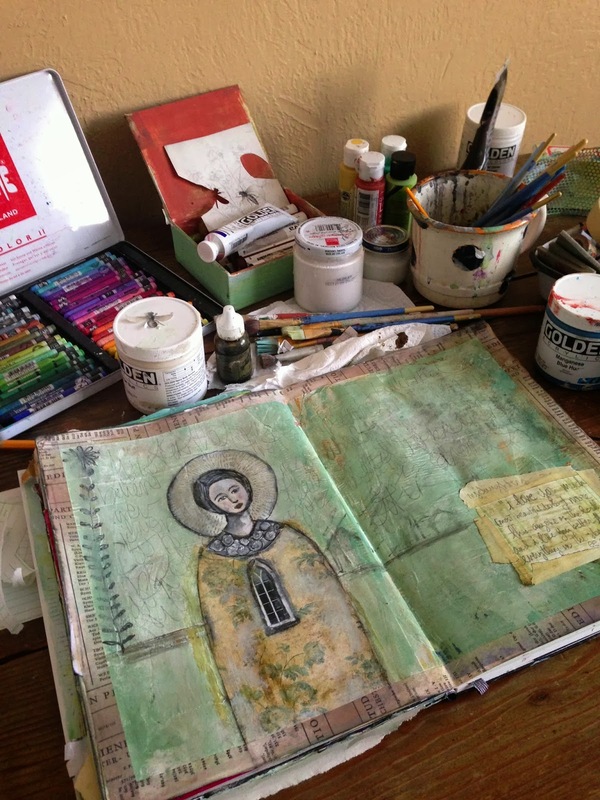 i had lots of ideas swirling around in my head from the workshop, so i sketched a few out in my journal along with collage and painting. sweet , sweet girl. 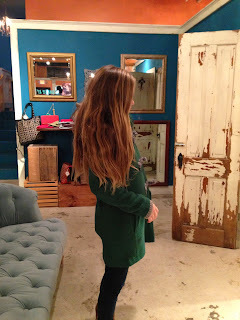 a new coat from "the lucky penny" in boone. we all loved that shop….if you're ever in boone, be sure to check it out. the owner is super nice and they have really cool clothes and jewelry. this is a little souvenir from blowing rock. (the bee charm)…..i took the girls into town to look around and have lunch, then we got on the blue ridge parkway for a little while to enjoy the absolute beauty of the nc mountains. i love that these girls love being sisters. 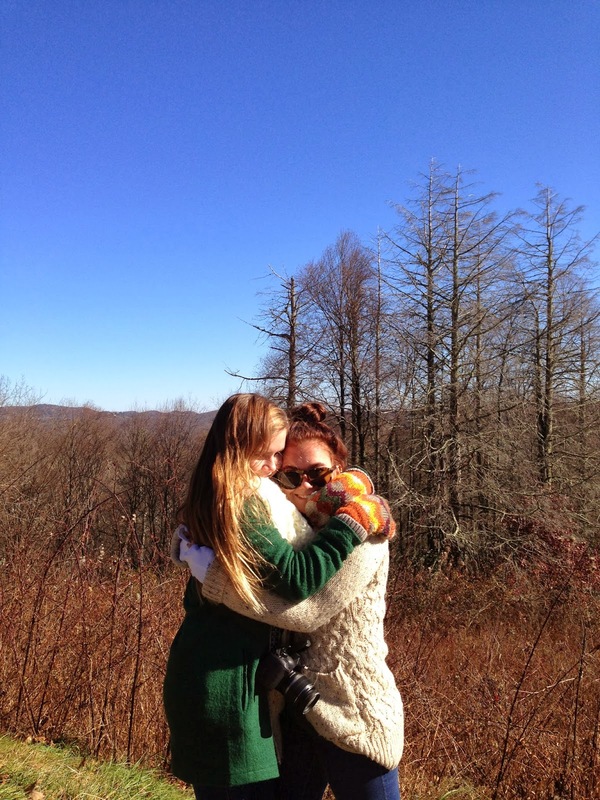 back to boone …..more sister fun. we found lots of cool back drops around town….graffiti and painted walls …. we all loved the tree skeletons. we had such a good time…..found treasures at the thrift stores…enjoyed each other…the food was yummy, the scenery beautiful beyond words…..blessings tremendous. no matter where we go, it's always good to get back home. and honestly, traveling makes me appreciate "home" more. join us for festivities…holiday spirit…. 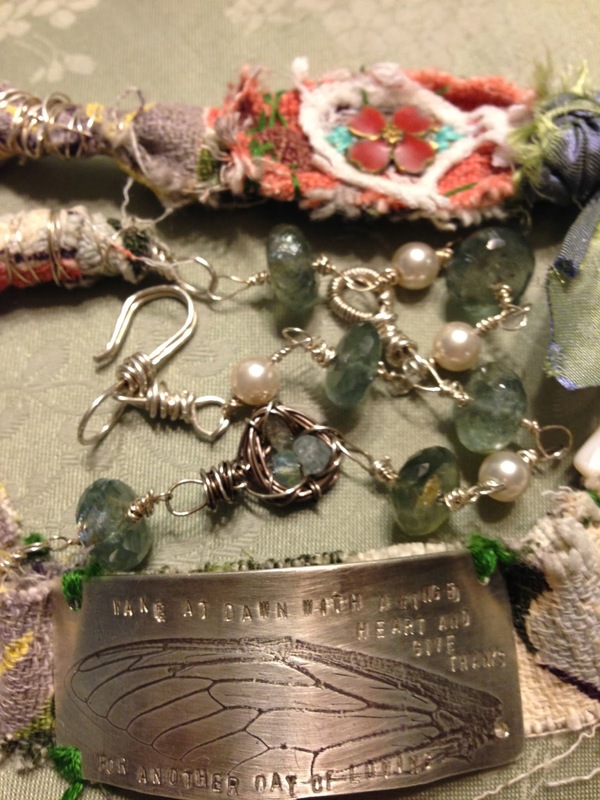 ……..check our my new jewelry and art…. your bracelet is stunning - and i can feel the love that went into it from here. it is truly special. i am sure you must have had a wonderful time working and talking with nina! and it looks like boone was a memorable trip for all - creating memories you each will carry close to your hearts. 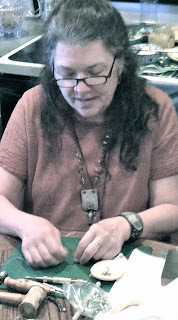 Hi Kim, you captured the workshop perfectly! I had such a great time and feel so inspired these days. Thanks for hosting, let me know when there's another workshop at your place!